How can we, as community builders, use the power of story and peak moments to build better community strategy? That is the question that challenged me during and after this year’s CMX Summit. 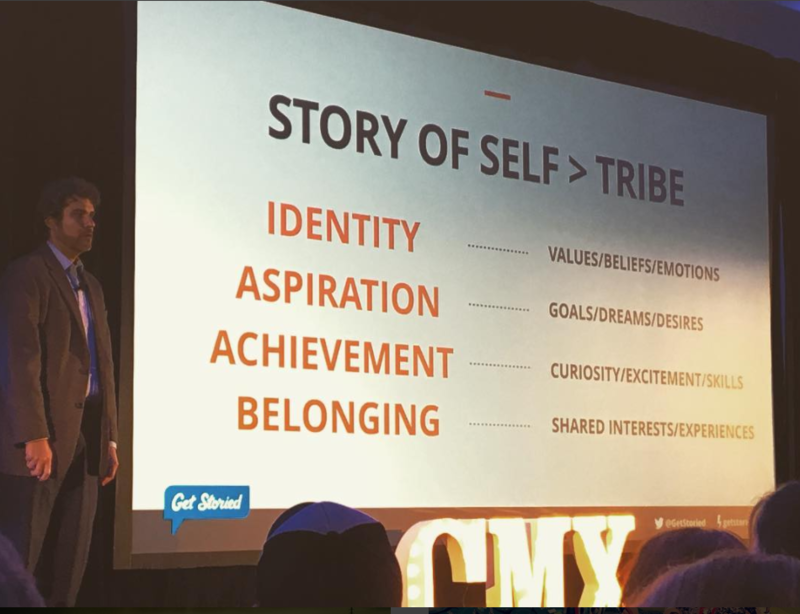 And in the spirit of working out loud, I wanted to share what I learned at CMX and how I’ve been exploring that question since. CMX Summit was an inspiring three days at the REEF in Los Angeles packed with sessions, strategy workshops and memorable breakout chats with other community leaders. How can we use the power of moments to make the online community experience more valuable and enhance the member journey to transform visitors into members and members into community champions. What got me thinking about those two big ideas was the Wednesday morning’s session, a wonderful one-two punch that I’m still processing weeks afterwards. First Michael Margolis spoke about story and then author Chip Heath shared parts from his new book the Power of Moments. First, Michael took us through an exercise asking questions encouraging us to explore our personal origin story. He emphasized that, as community builders, we can’t share the story of others if we haven’t thought about, are aware of and are comfortable telling our own personal story. We did this short yet fantastic worksheet activity as we took a minute to write down our answers to a few prompts about our life story and then we turned to a partner and shared the answer with each other. This exercise resonated with me and it got me thinking about harnessing the power of the individual story of community members. That five minute exercise reminded me how important it is to stop and truly focus on community strategy at a personal, granular and individual member level. So often we think of community as a big group of people and yes, that’s important and true. But far too often, and to the detriment of the greater purpose and long-term success of our community, once the community grows we often forget that community is made up of individual people who each have their own stories and vital personal narratives. And with those personal narratives community members bring their own stories to the community each time they log in. But, why? And is it worth the time? I wondered. Yes, it is. It’s worth every single second because when you think about all the individual stories of your community members you can better understand the broader impact and the shared purpose and share value of your community. By thinking on both a broad strategic level and on an individual member level you can better uncover and connect the common threads and similarities of each member more clearly. And you will ultimately make your community strategic more complete and effective. Essentially, by thinking with a story mindset, you appreciate the greater whole of the community. You appreciate how and why the community is connected. You can start to think about better ways to engage your members in ways that matter to them on a personal level. And you can begin to think of ways to bridge gaps through the intentional and strategic practice of storytelling. Listing to what Margolis shared and learning more about the work he has been doing with Getstoried is important for community professionals to understand and put to use. For me, I saw two key ways this storytelling perspective can be a strategic community-building advantage. Harness and unleashed the power of your community’s origin story to inspire others. Using the power of origin stories is an exciting way to tell the broader mission and value proposition of your community. Like all superheros, your community has an origin story and you should spend time finding it and get good at telling your community origin story with passion and conviction. If you don’t have one, then you should begin to question, whether or not you should even be creating a community. Once you discover your story, you need to begin to shape and mold it. How well you tell your community origin story and communicate it to your company, your customers, new members and doubters, and how well you connect your origin story to the value proposition of your audience and organization will directly influence the long-term success of your community. And remember that your community story should connect in some way to the mission of your company. Your community origin story should amplify the value and promise your company makes to its customer or employees. Your community origin story should influence and enhance your customer experience at a profound level. Like your community’s mission and purpose, your community origin story is the most important story to develop first because your community origin story will determine which individual stories you tell and how you tell them. Cultivate and discover your community’s individual member stories. Margolis’ talk got me thinking deeper about how every broader community story is made up of an inspiring mosaic of individual member stories. And just like spending time crafting your border community origin story, you should dedicate time searching for and then using the power of individual members stories to inspire and engage your organization. Where do you find individual stories? You might consider looking first at your community use cases or success stories. You should also dive into your community itself and observe and listen to how your community members are finding value. Make it a regular activity to connect with your members and ask them how and why (or why not) they’re finding value. Ask your members about themselves and learn about their careers, hobbies and interests. Reflect on what you learn and see how your member’s career and life stories connect to your community origin story. Getting to know what makes your members tick and building relationships with them is one of the reasons I love community building and I hope you love this process too. Once you find your success stories it’s time to focus on a few and develop them. And, yes, there’s a powerful way to craft, refine and share them. When sharing individuals member stories with stakeholders, skeptics and others who aren’t yet supporters of the community, I use a concept often used in movies called the “story arc.” I use the story arc in a couple ways. To help leaders and stakeholders understand the long journey and the gradual transformation a community and its members go through. I then take it a step further and use the power of a community’s story arc to illustrate how that community, and communities in general, can help drive value for their organization. Basically, I use story arc to make the community more real, human and compelling to each audience I talk with. With these approaches in mind you should use the story arc to re-frame how you explain community development. Reframing the value of community development in terms of how a movie character develops is important because it compellingly highlights and quickly demonstrates the fact that community takes time and, just like people evolve in their own life or during a movie, a community’s story and the story of it’s member’s evolves over time too. Think of your favorite movie and how it took the lead character or other characters time (months and or even years) to grow and evolve into the hero that they are at the end of the movie. It’s the journey and what the hero experiences along the way that matters. And there’s no rushing this process. How a story’s hero responds to the challenges along the way is what makes the hero who she or he is. Same goes for community. Community members are human and you can’t rush a community member’s experience. Sure, you can accelerate and cultivate the process in many ways, but you can’t rush the collaborative relationship that develops between a community member and the community. It’s both important and exciting to think of how you can use the power of story and the story arc to help stakeholders understand how communities and community members evolve along the value-add journey. For example, I’ve used the story arc many times to illustrate how a disengaged customer or employee transformed from a community critic to a fully engaged champion. And I’ve used the story arc to show how an active community member transforms into a powerful advocate for the company brand and mission. Simply put, the story arc is your framework for building your individual member stories and transforming them into a powerful tool for community adoption. Put together and told in the right way, a compelling member transformation story can turn a doubting stakeholder into a fully dedicated supporter of your community vision. Build your tool belt: Be ready to share your stories at a moment’s notice. That said, once you begin to develop your member stories, you should think of using your collection of individual community stories like a tool belt you can quickly pull from and be ready to share at moments notice. You need to be ready to share your best stories, but most importantly you should have a collection of stories to pull from because just one story won’t connect with everyone. You must have a portfolio of short, yet compelling, community stories you can use in different moments, because the right story shared with the right person at the right time can be what gets adoption going and rolling at your company. I can’t stress this enough. Don’t rely on just one member story or just your broader community origin story. You should think in terms of key personas. Think in terms of your audience. Think how you can create and find success stories in your community to inspire each of your key personas that you want to reach. Okay, so that’s what I was thinking about after Michael Margolis’ session. Now, here’s a few takeaways from Chip Heath’s session. Chip Heath Session: How Can We Build Peak Community Moments? Focused on highlights from his and his brother Dan’s new book The Power of Moments, Heath’s talk got me thinking more about all the key touch points of the community experience and how creating peak moments is so important to making the community valuable to customers and companies. In his book, Heath focused on four key moments; moments of elevation, insight, pride and connection. In the context of community experience, what resonated most with me was the idea of building moments of elevation or what Heath calls peak moments. To illustrate building peak moments, one concept that Heath shared was the idea of focusing our max effort on elevating the positives into peak moments. 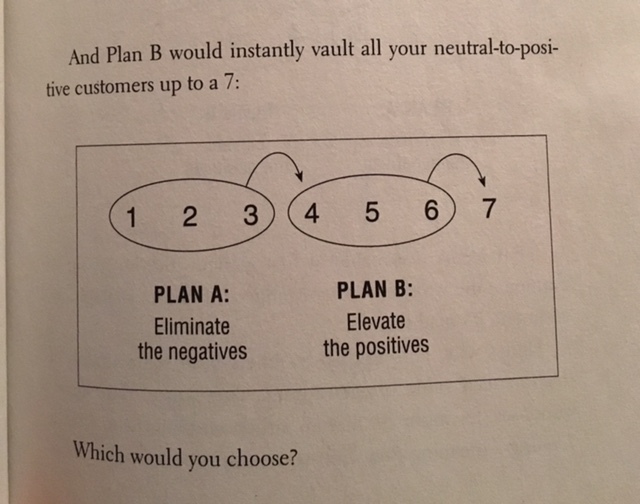 He used a scale of 1-7 and showed how most companies focus on improving the bottom rung (1-3) of customer feedback surveys instead of focused on improving the (4-6) more positive feedback issues and moving those to 7’s. He then explained that this focusing on moving the 1-3’s approach is a waste of time and not very strategic either. Focusing on the negative moments is more costly and time consuming and often doesn’t support the law of 80/20 either, which states we should focus our efforts on the 20% areas of business that generate 80% of returns and revenue. Essentially, what Heath is saying is that we should work to take the good moments and use them to make great moments or “build peaks.” We should find ways to make what is working and make those moments as best as they can be. This concept and different perspective challenged me to think more about what it means to build peak moments for communities. And I began to ask myself a bunch of questions. How can having a “build peak moments” approach help us build better communities? Do we as community builders spend too much time trying to resolve negative issues? Do we get too focused adding new flashy features to the community instead of focused on the basics and what’s working and just make little tweaks to transforming the “good” UX/UI moments into great moments? Do we get too focused on growth and acquiring new members and don’t focus enough attention on building and nurturing the relationships with current “lurking” members moving them to active members and transform active members into empowered advocates? How can peak moments help us make our community homepage and what first-time visitors experience more impactful? How can peak moments make the onboarding experience more engaging and valuable for new members during the first 30, 60, and 90 days of joining the community? And what about peak moments and how community managers approach their work…? How can a peak moment approach help community manager change and evolve how they moderate discussions? How can peak moments approach help community builders be more strategic in their daily, monthly and yearly planning and execution? How can we use peak moments to change relationships that are critical for long-term success of community adoption…? How can building peak moments encourage collaboration, co-creation and knowledge sharing among customers and staff? How can community managers use peak moments to facilitate new and deeper connections between members? If we think more about community strategy through the lens of peak moments, we can better focus on the most important member behaviors, scale those critical momentum-building actions and eliminate the unnecessary actions that don’t deliver value or don’t drive adoption or engagement. Like the 80/20 rule helps business focus resources on what produces results, we can use peak moments to better focus how we spend community resources and stop wasting time on tasks or members that don’t deliver ROI or long-term results. Simply put, having a “build peak moments” approach when creating and evolving a community strategy can lead to peak value and adoption for your community. 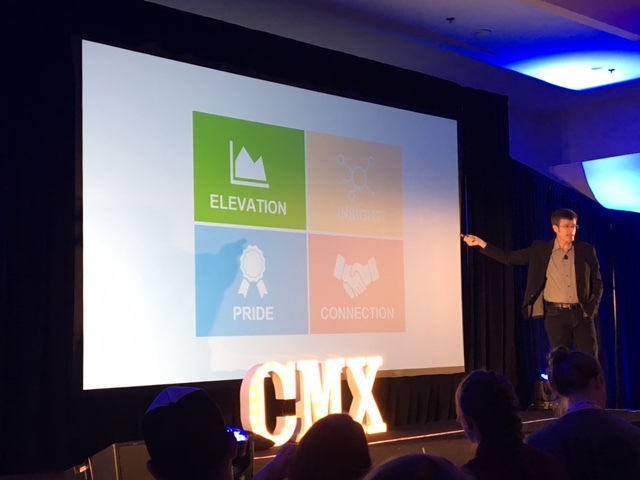 Without a doubt, the CMX Summit was a “peak moment” for me this year and I’ll be experimenting with these ideas and questions more as I continue to build strategy for the communities I’m working on. And look forward to sharing more of what I learned with you in the future.